Occupying the western third of the Yucatan Peninsula, the state of Campeche (kahm-PEH-chay) is the least visited of the Yucatan's three states, and is a blessing for those wanting a respite from the hordes of Peninsula tourists. The state's capital is the coastal colonial town of Campeche (population 250,000). A 2-hour drive south of Merida, Campeche is a captivating port filled with naval history, Baroque Spanish architecture, and aging beauty. For seaside relaxation in a historical setting, this is one of Mexico's best offering. Founded in 1540 by Francisco Montejo, the son of the founder of Merida, Campeche was terrorized by pirates and marauders until the city was fortified in 1668. In 1686, Campeche became the Yucatan's principal colonial port. As a center of wealth, Campeche became a guarded colonial outpost richly appointed with fine mansions and civic buildings. As was done in Cartagena, Columbia, a thick stone wall shaped like a hexagon stretched some 2.5 km. surrounding the city. Eight strategically placed fortresses made the city impregnable. Although the wall is gone today (replaced by a highway surrounding the city), seven of the eight original bulwarks (baluartes) are still in place. Four of them are of great interest with museums, tropical gardens, libraries and folkart exhibits.You can explore the sights along a 2 km. walk around the old city. Some of the tunnels that once connected the bulwarks are also available for exploration. Campeche's main square, Plaza Principal, is delightfully colonial, despite the presence of modern accents. Just off the square stands the Yucatan's oldest cathedral, Catedral de la Concepción, begun in 1540. 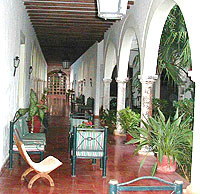 Two blocks to the east is the interesting Museo Regional, a museum dedicated to the colorful history of the state. To the north of the plaza is the Mansión Carvajal, one of the city's many opulent mansions. To the south is the Casa de la Cultura. Another example of Campeche's colonial wealth. At sunset many people stroll the waterfront (malecón) past silent rusty cannons that once defended the port. For shoppers, the city's colorful markets sell some of Mexico's best Panama hats (and-woven in the humid subterranean tunnels in the city of Becal, between Merida and Campeche) and world-famous hammocks. The archaeological site of Edzna is east 60 kms. from Campeche city. It is considered one of Mexico's most important, but least visited Pre-Columbian sites and this provides for a leisurely visit of the grounds. Calakmul Biosphere Reserve occupies the state's eastern border with Quintana Roo.This enormous reserve is home to Mexico's largest track of tropical jungle covering 1.5 million acres. Campeche City has essentially no beaches, but 33 kms. south you'll find a beautiful beach at Seybaplaya with white sand and small fishing huts.